Firstly, and I think most importantly, I am an archer. I am at archery competitions / events most weekends. If you need advice, the chances are I have been there and will be able to help. loves archery so much that I have taken it up full time. Tony Weston - Owner of The Archery Company. I loves all things archery and I am well known on many of the Archery circuits. I have also competed on the European Pro Archery Series and on the ASA Circuit in the USA, shooting as Open Pro. 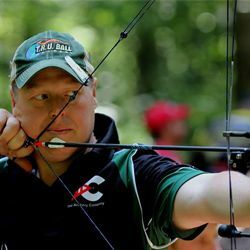 I am hands on with the business and love helping archers with coaching/bow adjustments. Nothing beats being able to sign off a beginner and introduce them to this amazing sport.